Our platform can be the infrastructure for Drone Pilot registration and verification as well as their drone registration. View live flights, flight logs, communicate with pilots direct & live within the platform. Flight notifications. All data that populates the dashboard and the app is backed up and online so it is always up-to-date and synched across devices. Within the platform it is possible to schedule events and no-fly zones just like it is with NOTAMs. With the help of drone pilot mobile app and integrations it is possible to receive notifications about live drone flights. This feature can be very valuable for airports. 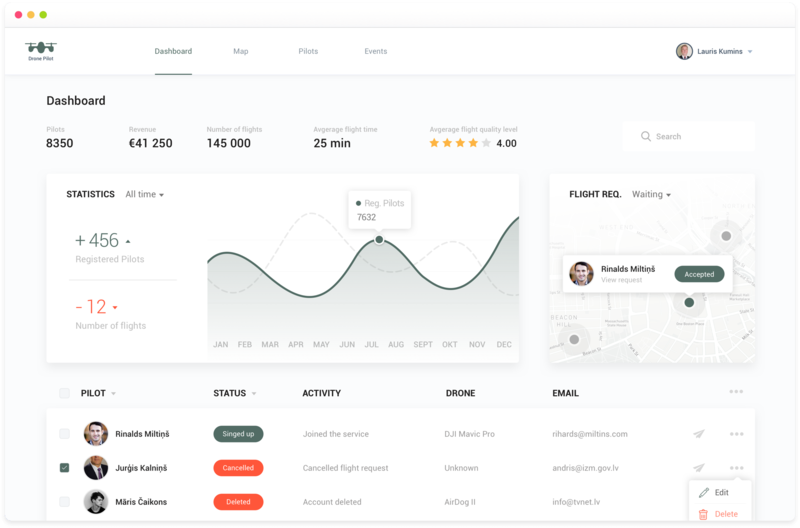 The dashboard enables a direct communication with drone pilots which can help both parties in questions or different situations. Our database is searchable and this enables the ability to search for a pilot, certain flight or any other information that is necessary. From the Drone Pilot management dashboard it is possible to add new "No drone zones" or manage the existing ones. Main dashboard view that holds graphs and important metrics is customisable and can be personalised. All of our connections and features are built with data security in mind. So that is a thing that our clients and users do not have to worry about. We offer white-label solutions or new feature integrations so if you have a feature in mind - send us a message and we might add it.